Pony Club can be joined at any time. Please inquire for more information. Certificates available are D D+ C and C+. We supply the horses. Fully qualified Instructor with 31 years experience. Learn horse management as well as riding. How to catch, groom and tack up your horse, feeding and covering. Learn how to do dressage, from basic to more advance movements. Jump a course of show jumps. Pole and grid work, and play games on horse back. Road riding, farm, beach and forest riding. 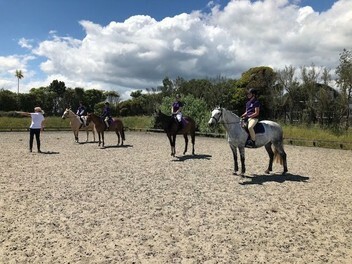 Our daughter has lessons at Diamond Lodge and grazes a pony there, and we cannot speak highly enough of our experience. Our daughter has come a long way in her knowledge, skill and confidence. She has also made some great friends through the shared interest/passion. The facilities are awesome too! My daughter loves coming to Diamond Lodge for group lessons every week. Our family highly recommends Sarah and her staff. Very professional and top notch instructors with very well looked after horses and ponies and fantastic facilities. Sarah works very hard, thank you for everything you do. Photo 1 was the first pony club ribbon day of the summer 2014 season and the Diamond Lodge girls cleaned up! Sarah trains them well...girls and horses. The girls had so much fun and we were very proud of the girls efforts and of Sarah's support. We are looking forward to this season. We have been with Sarah for two years and can highly recommend her. Sarah was away when we went for my daughters lesson. Double booked with another child & very disorganised. The experienced riders cantered around & through her lesson which frightened her.The pony was difficult to get to walk despite kicking & only started moving when instructor picked up a whip. The area around the stables is dangerous as its also the carpark. Cars come & go constantly & kids/ ponys everywhere - an accident waiting to happen. Went to pay but girl didn't know how much it was! a very professional set up with incredible tutors. Highly recommended. I have a 3 day cattle muster holiday booked in Australia in May and with Diamond Lodge assistance, I believe its going to be an experience that is fully enjoyed and prepared for. Diamond lodge is a great place to ride. I have ridden here for 5years having group and private lessons and Sarah is a great instructor, she knows when to push you to improve and understanding when your not feeling so brave. The horses are good and safe and it's great to see the kids learning here get the opportunity to go to pony club and shows. Wish I'd had that opportunity when I was young and learning :-). Diamond Lodge has some great horses for all levels, they are ploddy when they need to be for beginners and advanced for the more expeirenced rider. Sarah mixes up the lessons so they are never dull. Very happy with the service at Diamond Lodge. Best riding school ever i have been riding her for 4 month now and i have improved so much, i have done two shows on Sarah's horse and both were great with such good outcomes. Sarah and her horse have given me so much confidents. Diamond lodge is such a great place to learn to ride. Super super fantastic! Enjoyment and fun for all (men and women, boys and girls). Very experienced instructor who is confident around her horses and a great teacher! They all made me feel confident riding, and even with my allergy to horses they did everything to make it possible and enjoyable for me without any medical problems. Overall extremely impressed and would recommend to anyone of any age. A+++ Thanks Diamond Lodge Equestrian! Sarah is a fantastic instructor with a wealth of knowledge. Because of her willingess to answer my endless questions on horse training, my horse has improved greatly. The combination of Sarah's well trained horses and excellent facilities along with her great sense of humor and patients when explaining things make Diamond Lodge an A+ choice. I couldn't ask for a better instructor. Thanks Sarah! Hi Sarah, Just wanted to tell you that the party was wonderful! My daughter (7) and friends had a wonderful time and it was so easy for us as parents to enjoy it as well - no stress! The environment in the stables with horses all around is great for the pony-loving children! Thanks so much to you and your girls - we'll be recommending it to others ! We had a wonderful pony party here and all the kids were excited, entertained and all raved on about it for the following few days. :) thanks so much Sarah. My daughter has being riding with Sarah. In the short time while having lessons with Sarah my daughter has grown confidence and learnt a lot about every aspect of riding. With Sarah's support and encouragement my daughter has even tried the jumps. My 8 year old daughter asks every day to go riding with Sarah. A big thank you to Sarah and I look forward to many more lessons with you. I strongly recommend Sarah and her riding school. My daughters 18 & 17 have been riding with Sarah for 6 years. It has been the best riding experience for both of them and thanks to the lessons their riding skills have come along in leaps and bounds. Both have competed on Sarah's horses and thanks to her instruction, have been very successful. Both my daughters sing Sarah's praise and love the horses and environment at Diamond lodge. Extremely disappointing. My daughter was looking forward to a very special day, but it turned out to be an upsetting and frightening experience. My daughter is a new rider and Sarah incorrectly advised her about approaching the horse; the horse knocked my daughter to the ground and bit her on the arm. Unsafe environment with an uncaring instructor. Strongly recommend you look elsewhere. My young daughter has been riding with Sarah for 5 months now and we are amazed at how well she is doing. Sarah is an excellent teacher and her facilities and horses are fabulous! A fun and safe environment. Highly recommended!